Both .dwp and .webpart file types are used to describe where the code is for a web part. They are XML web part descriptors deployed with the web part. The difference is .dwp was the file extension used in version 2 of SharePoint and .webpart is a new extension used in version 3. Inside the files, the schemas are different. Microsoft.SharePoint.Portal.WebControls.SearchBoxEx is one of the older ones and therefore requires a .dwp descriptor. We have to create a .dwp descriptor for the webpart. · We need the assembly's public token. 3. Set the Assembly version to your assembly's version. This is usually 1.0.0.0, but you can find it in AssemblyInfo.cs in your project. 5. Replace the TypeName with the type name in the .webpart file. 6. 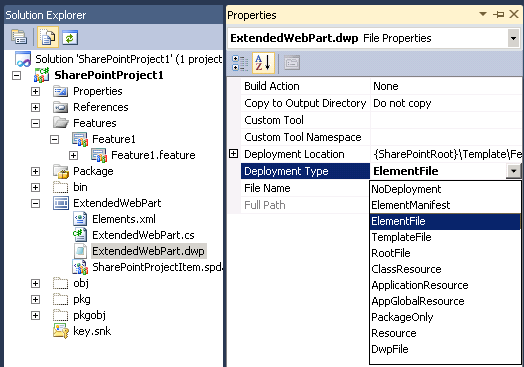 Select the .dwp file in Solution Explorer and change its Deployment Type property from NoDeployment to ElementFile. This will ensure .dwp file is deployed with the web part. 7. Verify that Step 6 adds an entry to the .spdata file. 8. Delete the .webpart file. So the final view will be like this. 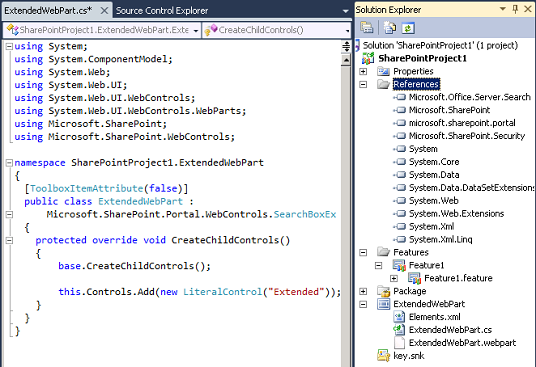 This is how I extended Microsoft.SharePoint.Portal.WebControls.SearchBoxEx. For the purpose I had to reference two assemblies Microsoft.Office.Server.Search.dll, microsoft.sharepoint.portal.dll from ISAPI folder (Program Files\Common Files\Microsoft Shared\Web Server Extensions\14\ISAPI). Thank you! Saved lot of time.